He told Asian Scientist magazine that he is working on technology that allows for "virtual communication of touch, taste and smell by digitizing these senses." In the instance of smell it's a claim that now has scientific backing. In a paper published last October, in the journal Virtual Reality, researchers from the University of Ottawa found that the addition of smell when in a VR environment "increases the sense of presence." The 'unpleasant odour' in this instance was piped into the room from an exterior accessory, a common method of simulating smell for VR users. Likewise, Valencia-based Olorama's wireless aromatizing device does exactly that, fanning smells, such as 'pastry shop' and 'wet ground', around a VR play space. At present this smell hack, if you will, is the easiest way to imitate odours. But simulating smell just isn't that simple; it requires the imitation of molecular science, and ultimately the replication of certain molecules that trigger electrical pulses in brain. As a result, Dr. Cheok's dream of digitised senses remains a long way off. It's in the area of the curated experience - in the form of perfumery, temperature, and haptics - where we're seeing developments. Premiered at Gamescom last year, Ubisoft's Oculus Rift send-up, the fart-simulating Nosulus Rift, gives gamers the ability to smell the farts of characters from the second South Park game, appropriately named The Fractured but Whole (Don't get it? Try reading it aloud). "The Nosulus Rift is a fully functional mask using sensors activated through inaudible sound waves in the in-game fart sound, every time the player makes use of his nefarious [fart] powers," an Ubisoft spokesperson told us. "Each time the sensors are activated, they trigger the odour's puff. Meticulously and without mercy." Virtual flatulence not your bag? How about virtual body odour, breath, or even private parts? Earlier this year, adult entertainment webcam platform CamSoda announced a device called the OhRoma; a gasmask-style wearable with interchangeable odour canisters that releases smells matching any of the thirty 'broadcast' by a cam model via Bluetooth. The company is taking pre-orders now. Both of these nasal wearables don't allow for the interaction of smells, however, and that's something Tokyo-born but Silicon Valley-based startup Vaqso VR demoed back in January with a Mars-bar sized VR accessory that's able to emit multiple smells at once. The showcase revealed that players of a VR experience could smell not only the gunpowder of a gun but also the scent of a peach when it was pierced with a bullet. "This device makes your VR experience richer," says CEO Kentaro Kawaguchi, adding that he's also working on simulating taste. "We want to perfectly reproduce the various senses of the five senses. Currently we can produce smells though taste may take a little while to develop." Compatible with PSVR, Oculus Rift, and HTC Vive, with claims on the site that the team can make any scent on demand, the consumer version of Vasqo's VR scent device is scheduled for the first half of next year. Prototyped at GDC in 2015, the multi sensory Feelreal mask promised to simulate temperatures and imitate wet and warm environments using a sophisticated combo of misters, heaters, and coolers (plus an 'odour generator'). It didn't get off the ground after a failed Kickstarter campaign. One company that is delivering on their multi sensory promise is Sensiks. Its sensory reality pod, in which the user is seated, provides a totally immersive VR experience, augmenting the visuals from the headset with a set of exterior wind, light, and heat sense simulators - or, as founder Fred Galstaun puts it, "full sensory symphonies." "Real life reality is always full sensory and 360. Even a small cool breeze on the skin sets off the brain in ways you cannot even imagine," he says. "Within a closed controlled environment where all the senses, including audio-visual, are made 360, there is no difference for the brain anymore between real and fake. It has become reality for the senses." Galstaun calls his pods—which are currently used in medical institutions for PTSD trauma recovery and with mentally disabled and elderly patients—sensory reality or SR for short. "We place SR next to VR and AR, a brand new product category in the programmed reality scene." But, as pods, these stimuli are exterior. As we're seeing with smell, could temperature be incorporated into a wearable experience down the line? The sensation of temperature is something that Samsung's C-Lab is exploring with their T.O.B headband. As we previously reported, all we know about Touch On The Brain so far is that it generates the sensation of heat using an acoustic impulse that stimulates the brain. We asked for an interview but were told that because T.O.B is still at the very beginning stage in terms of development, no developers were available to chat. We'll be waiting patiently to find out more. As we all know, much of our perception of a meal relies upon different sensory inputs, from smell to sight to sound. 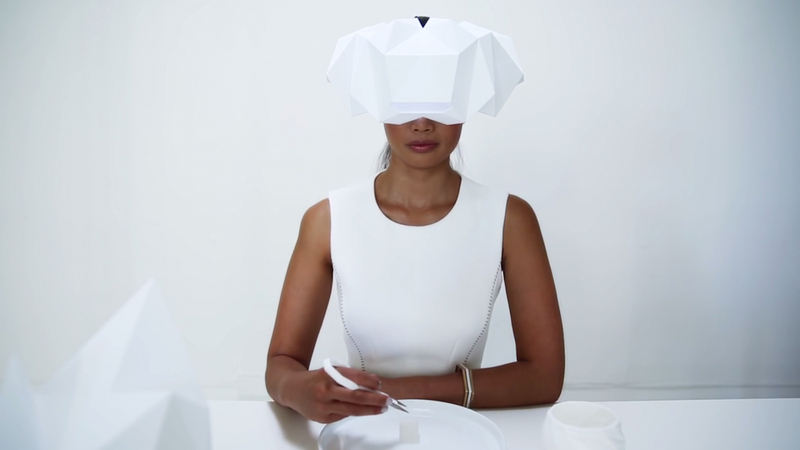 Building on this core principle, with the aid of a VR headset and specially-created technology, is LA-based Project Nourished, a gastronomic experience that's attempting to simulate eating by tricking the brain into thinking it's consuming food. Not that the brain is easily duped. The tech Project Nourished uses (main image) include a gyroscopic utensil and a virtual cocktail glass that allow the diner's movements to be translated into virtual reality, a diffuser to imitate the smell of various foods, and a 'bone conduction transducer' that "mimics the chewing sounds that are transmitted from the diner's mouth to ear drums via soft tissues and bones." Currently haptics are the most popular way of incorporating the sensation of touch into VR and it looks like this will be the first sense to . This starts from something as simple as Go Touch VR's finger cover accessory that simulates the sensation of force you get when your finger encounters a real life object. It's a VR glove without the actual glove part and it works with a rough schedule from the French startup of early 2019 for mass production. At the other end in terms of both impact and expense, the Rez Infinite Synesthesia Suit, created by students at the Keio University Graduate School of Media and Design in Japan, is a full-body Velcro haptic VR suit that's kitted out with small motors that vibrate as you journey through the virtual world. It's been described as like "traveling through a psychedelic kaleidoscope". Experiences like this hint that we're on the road to multi sensory VR but we're unlikely to see much of it brought to reality in 2017. Still, next time you're dazzled by the sound and picture of a VR experience but your body is crying out for something more immersive, just remember that it's a work in progress. Buckle up, it's going to get bumpy.